The newly merged Department of International Economics, Government and Business applied untraditional methods to their merger process. 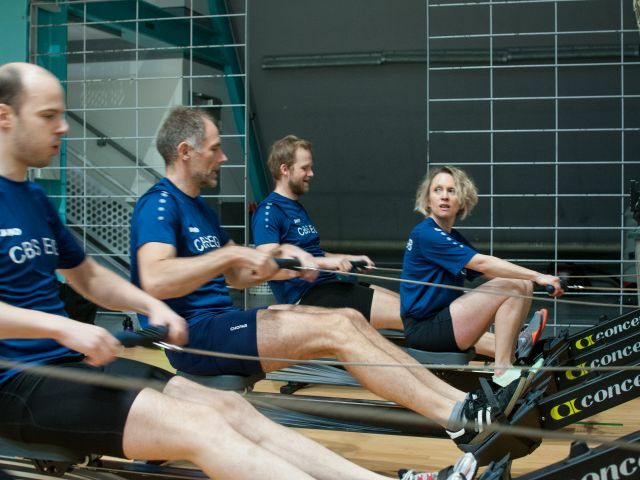 A team of five faculty members just competed in the European Rowing Indoor Championships. Next year they expect to enter at least two teams. “It’s only 500 meters, but it feels as long as a month of Sundays, I can tell you. 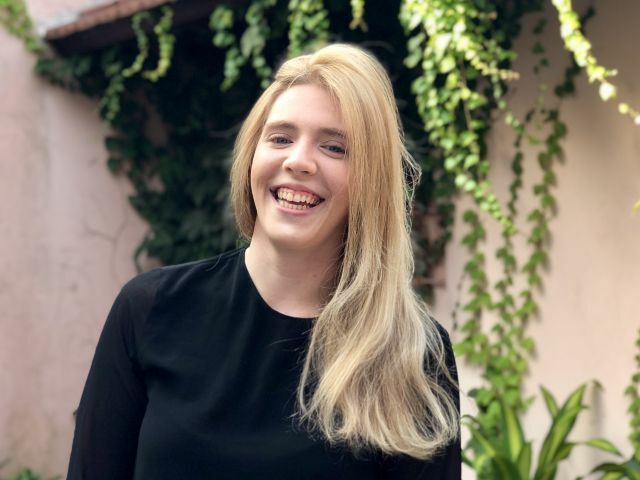 And, although the entire race is over in seven or eight minutes, it feels like forever,” says Peter Gammeltoft, Professor MSO at the Department of International Economics, Government and Business. 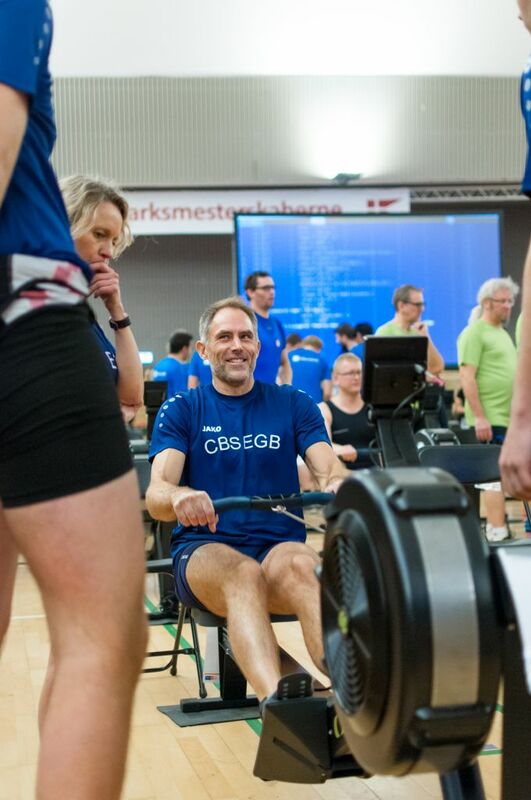 Along with four other faculty members from the previous Department of Business and Politics and Department of International Economics and Management, he’s just competed in the European Rowing Indoor Championships, and took sixth place out of 15 teams by completing the two kilometers in 7 minutes and 40 seconds. However, participating in the competition wasn’t really about setting records or getting on the podium. It was about flexing the muscles required for a successful merger: teamwork and performance. It was Jens Olav Dahlgaard and Peter Gammeltoft’s idea to compete in the indoor rowing event as both of them already row. 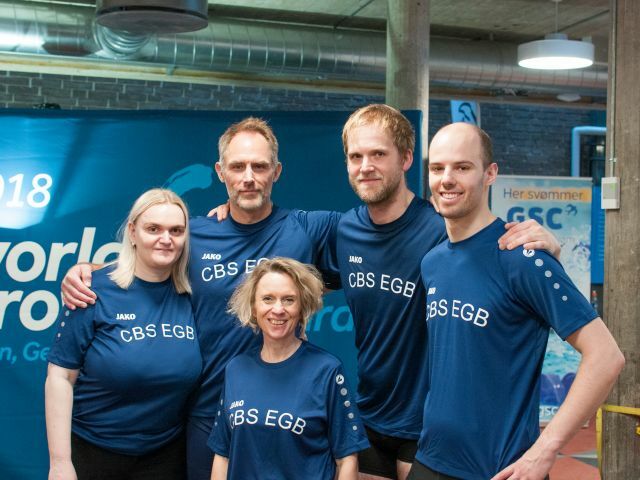 Shortly after, Caroline de la Porte, Niels le Duc, and Yvonne Borkelmann joined – albeit with limited knowledge about rowing, therefore some training was needed. 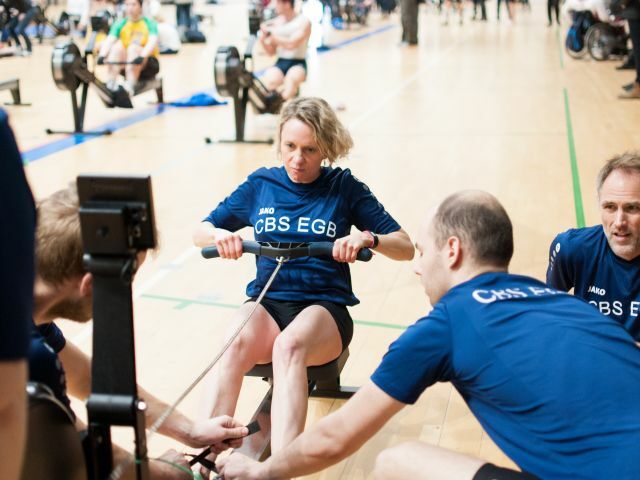 “To get everyone up to speed, we did some training sessions at my rowing club, and at CBS Mercury. We focused on the change-over between the rowers, as each rower has to do 500 meters, and then change. If something goes wrong during the change-over, it can cost you precious time,” he says. Now that the team has participated in the competition, more faculty members have shown interest in the indoor rowing team, and this makes Peter Gammeltoft hopeful for next year’s competition. “More people have shown an interest, so I’m most certain that we’ll be able to present two teams next year,” he says. So, would he recommend other departments to pick up their oars and start rowing together? “I think rowing is an ideal sport for everybody, both mentally and physically, and especially if it’s turned into a social event. 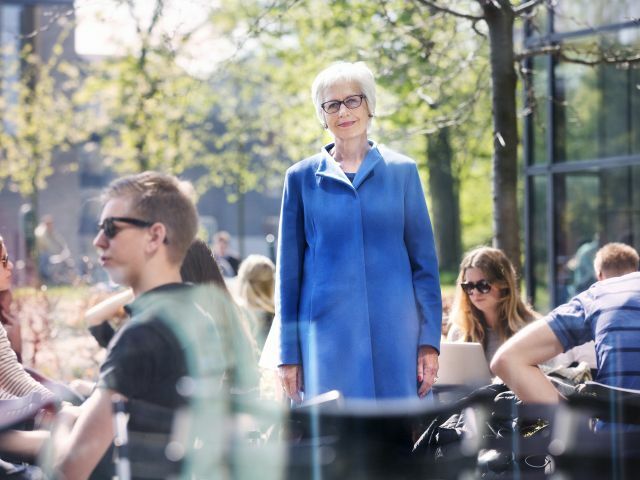 It may also be a good way for international students to kick-start their social life in Copenhagen, which can be a tough nut to crack sometimes,” he says. 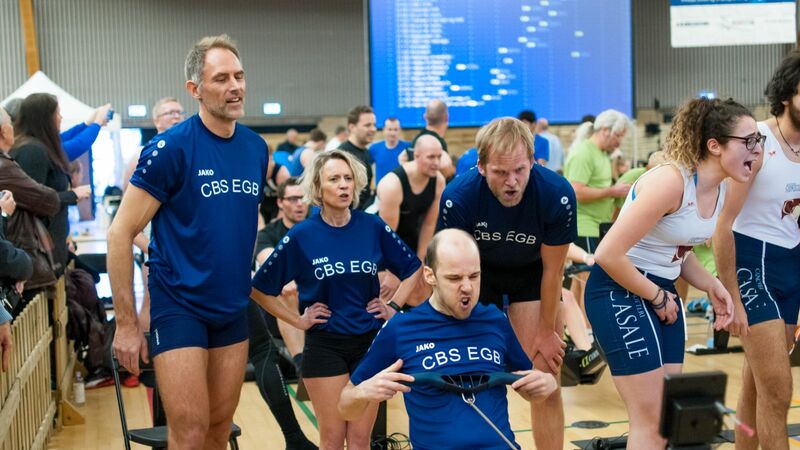 A few years back, CBS did briefly have a student rowing initiative which Peter Gammeltoft was involved in, and CBS even pledged some financial support for outfits and so on. But as the students graduated, the team fizzled out. He hopes that the new faculty team will spread and involve students in the future, as rowing is an ideal university sport, he argues. “We have a very active rowing community in Denmark, and I think it’s a shame that Danish universities don’t practice it like in other countries. It would enrich university life for both students and faculty, and with the eight Danish universities, all close to the water, it would be ideal in terms of doing contests,” he says. Hi, we have startet University Rowing in Copenhagen in 2018. Everybody is welcome. We have several students joining from CBS.